Soft soils are problematic since, under load, they can produce large settlements over a very long time span. These soils are widespread in the coastal region of Eastern Australia, where the population is increasing fast and much infrastructure has to be constructed. One research project carried out by the Centre concerns the 'Ballina Bypass', which is being constructed on an estuarine soft soil deposit in Northeast New South Wales as part of the multi-billion dollar Pacific Highway upgrade program. In order to assess the likely foundation behavior, two trial embankments were constructed during 1998. They were instrumented with settlement plates, vertical settlement profilers, vibrating wire piezometers and horizontal profiles. The site investigation, sampling, installation of instruments were performed by the RTA and Robert Carr and Associates Australia, while advanced laboratory tests were performed in the Centre's Geotechnical laboratories. 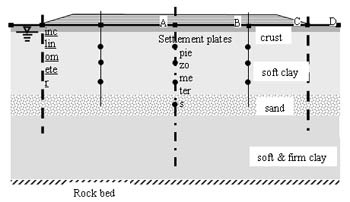 The project aims to improve our understanding of soft soil foundation behaviour and, hence, to establish a predictive numerical model for estimating long-term settlement. This, in turn, directly affects the construction sequence and maintenance of the highway. Subsoil stratums and soil properties are determined from borehole logs and laboratory tests. However, the Centre's CPT can be employed as a supplementary approach to achieve extra data at a low cost. Laboratory tests were conducted at the University of Newcastle. These tests including index tests, consolidation tests and triaxial compression tests and provided data on soil density, void ratio, moisture content, permeability, compressibility, and shear strength of the subsoil layers for stability and settlement analysis. 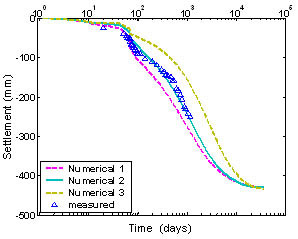 The numerical predictive model is based on the finite element method with fully coupled Biot consolidation theory. 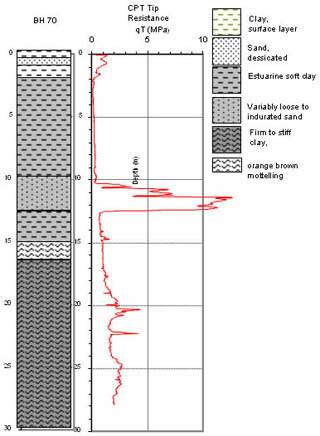 The soil behaviour was modelled with an improved critical state model, which can capture the key features of the behaviour of normally consolidated and lightly over-consolidated clays. 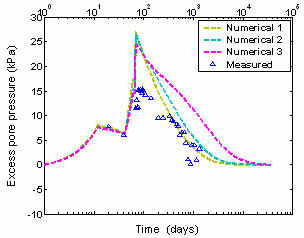 The numerical model has been calibrated against the measured data that have been collected for a period of more than three years from the instrumented embankment. The aim of the model is to be able to predict the long term behaviour of the embankment. Figure 6: Comparison of measured and predicted surface settlement.